It's a very exciting time here at The Earring Collection, we are very happy to announce that we are now stockists of Penny Warren jewellery. A graduate from Newcastle-Upon-Tyne Polytechnic, Penny is based in Brighton, West Sussex where she works from her studio. 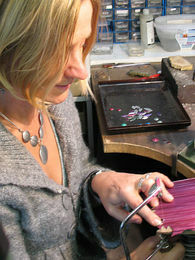 Her stunning pieces are made using pre-anodised aluminium and silver, a unique method wherein the aluminium is dyed by hand and the colours are then diluted to create the signature look on the metal. Inspired by land, sea and skyscapes, the stunning hues of the metal are intended to evoke a sense of empowerment in the wearer. therefore perfect for every day wear. due to the crafting techniques used. Available only in-store from 13th October!